Oh Olney Bell! Dear Olney Bell! The Spirit of our Olney. Founded in 1837 in Mount Pleasant, Ohio, the Friends Boarding School was relocated to Barnesville, Ohio -- western Belmont County -- where it opened in 1876. Since that date, Olney Friends School has occupied a spacious campus on gently rolling hills adjacent the large Stillwater Friends Meetinghouse, which you pass when entering the school campus. Olney occupies a special place within the Stratton family. 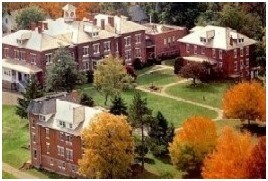 Many generations of the Stratton family have attended and/or been associated with Olney Friends School. For half of the first fifty years after the school was relocated to Barnesville, Ohio, Strattons served as Superintendent and Matron of Olney. The parents of George Stratton (the long-time operator of Stratton Mill), were Superintendent and Matron of the school between 1895 and 1903. During this time, George had been living in his parents' home in Flushing, Ohio. When his parents returned to Flushing, George bought and moved into what today is Stratton House Inn. The Stratton House Inn website plans to include extensive historical resources concerning this school, which has been and continues to be an important part of family and community life. For current information about Olney, please see the Olney Friends School website. For historical entries related to life in the vicinity of Olney Friends School and Stillwater Friends Meetinghouse, please see Little Home Histories, which was published originally in 1942. This book contains accounts of early families and their homes in Belmont County. Most of these families were Quakers who settled near Barnesville, Ohio, starting as early as 1800. Most came to escape the environment of slavery where they lived previously. These accounts describe the dangers of the woods, the struggle to settle the land, the farms and homes that were built out of the wilderness, early medicine and trades that were practiced, and the commitment to worship and education in the area. A new edition of the book is available in its entirety on this Web site. For additional historical entries on Belmont County, many of which relate to the Barnesville area, please see Historic Belmont County, Ohio. For other attractions in the area, please see Barnesville, Ohio - Attractions.